What Does Air Pressure Tell Us About the Weather? Air pressure is a very important atmospheric variable that plays a large role in our weather. 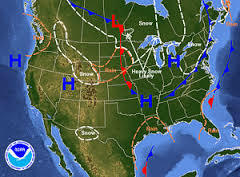 Like everything else, the atmospheric pressure is constantly changing and is connected to both temperature and humidity. AIR PRESSURE IS THE WEIGHT OF THE ATMOSPHERE ABOVE YOU PUSHING DOWN. At Earth's surface the air pressure is about 1 kg / square cm. How do we measure Air Pressure? AIR PRESSURE IS MEASURED WITH A BAROMETER. There are 2 different kinds of barometers that are used to measure air pressure, and each one uses different units of measurement. Mercury barometers are older and less common these days because Mercury is dangerous. Essentially a mercury barometer is a dish containing mercury with a glass column rising out of the center. As the air presses down on the pool of Mercury, it forces it to rise up the central column. In this case we use the units INCHES OF HG (MERCURY). An aneroid barometer also measures air pressure but in a different way. Basically an aneroid barometer is a slightly dented metal container. As the pressure increases it causes the container to crumple slightly, and returns to normal when the pressure decreases. A dial inside the container moves as it crumples and uncrumples. The units of measure for an Aneroid Barometer are MILLIBARS (mB). Using page 13 of the ESRT we can easily convert back and forth between inches of mercury and millibars. Like all weather variables, air pressure is constantly changing. These changes are driven by changes in other factors such as altitude, temperature, and humidity. It is therefore important for us to understand the relationship between air pressure and altitude, temperature, and humidity. You may have seen or read about Mountain climbers like the one shown, needing to bring oxygen tanks with them as they climb higher and higher. You may have also heard air at high altitudes referred to as being "thin". We know that air pressure is the weight of the air above us pressing down. So if we imagine climbing high into the mountains, as our altitude increases there is less air above us. If there is less air above us pressing down, the air pressure must decrease. As altitude increases, air pressure decreases. Cold air has high density causing it to sink down. The sinking of air adds extra force pushing down to the ground, so COLD AIR creates HIGH PRESSURE. Warm air on the other hand has low density causing it to rise. The rising air reduces the force of the air pushing down, so WARM AIR creates LOW PRESSURE. Humid air contains lots of water. As more and more water enters the atmosphere it displaces other, heavier molecules. As a result air that is humid is much lighter. Since humid air is lighter, it has less weight to press down with so it has lower pressure. What does Changing Air Pressure Mean? Now that we know these relationships, we can use our knowledge to make predictions about the weather using the air pressure. It will be cool with clear skies! Clouds are forming and storms are coming! Because air pressure can tell us so much about how the weather is likely to change, meteorologists track air pressure data closely. The best way to show air pressure data visually is to map it by creating an ISOBAR MAP. ISOBARS ARE LINES THAT CONNECT POINTS WITH EQUAL PRESSURES. 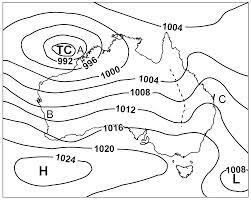 Isobars work in the exact same way as isotherms, and contour lines, so at this point we should be able to construct an isobar map easily.